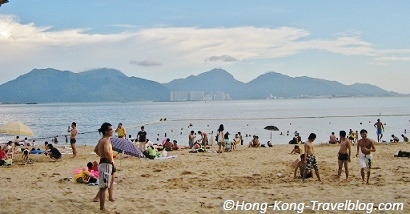 There are lots of beautiful beaches in Hong Kong, you can go swimming, sunbathing, surfing or simply go for a stroll. Wherever you stay in Hong Kong, you can find one nearby. No wonder why so many people fall in love with this city! Believe it or not, behind the hills of this concrete jungle and home of skyscrapers, there are 38 well-equipped Hong Kong beaches scattered around the territory. 10 of them are located in the Southern District of Hong Kong Island, the rest of them are clustered around the Outlying Islands, Tuen Mun, Tsuen Wan and Sai Kung Districts. Want to know where to go swimming in Hong Kong, have no idea where the beaches are and want to know how good they are? Living in Kowloon but want to access a Hong Kong beach? 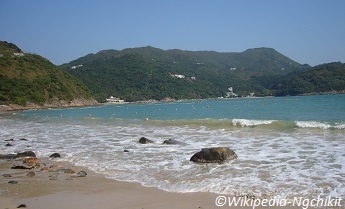 You are on the right page as I’m going to show you the best beaches in Hong Kong. It is a blend of a well-known tourist attraction and a luxury residential area. 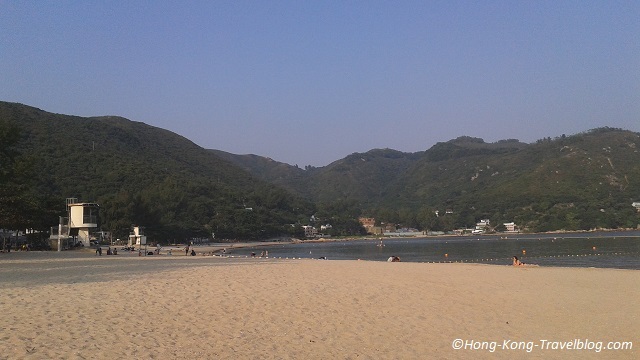 Repulse Bay is called “shallow water bay” in Chinese. As the name suggests, the water is so shallow which is quite good to go for a splash. The beach is long and wide, the sand is fine, the view is good, and hence many visitors and swimmers love going to this beach. You can also see some special buildings of colonial and modern architecture. Additionally, you can find statues of Kwun Yam and Tin Hau of over 10 meters high at the end of the beach. To learn more, you may be interested in the post I have written on Repulse Bay earlier. *Accessibility is determined by the distance from the city centre and the ease of getting there. It is famous for the wide beach, smooth sand, clear water and the rustic style. Shek O means “rocky bay” in Chinese. It is located near the small Shek O villiage, right outside the border of Shek O Country Park. As the location of it is quite isolated, the environment near the beach is tranquil. The region is virtually no building other than the luxury residential area in Shek O Headland. The Dragon’s Back above Shek O is the only paragliding site on Hong Kong Island. Paragliders can be seen over the beach. Some visitors also go sport climbing on the beach cliffs. A popular surfing beach, Big Wave Bay is is not far away. It ranked tenth in the World Top 10 City Beach by one of the world’s largest flight comparison sites. Stanley is a reputable tourist attraction located to the east of Repulse Bay, and to the west of Shek O.
Stanley is named after Lord Stanley, a British Colonial Secretary and later the Prime Minister. The Chinese name of Stanley is “Chek Chue” which means “red pillars” referring to red blossoms of cotton trees. There is also a legend saying that the notorious pirate Cheung Po Tsai was active in the region. Therefore, “Chek Chue” may actually imply “Chak Zhue” which means “bandits live”. Stanley Beach is welcomed by swimmers, windsurfers and watersport lovers. Dragon Boat Championships is held in June every year to celebrate the Tuen Ng Festival. At the back of Stanley Beach, you can reach the renowned Stanley Market, Murray House, a Victorian-era building, Stanley Plaza, and Ma Hang Park, a new public park. There are also some Chinese temples and historic buildings like the Old Stanley Police Station. The smaller St. Stephen’s Beach is just nearby. It is one of the five beaches in Castle Peak Bay, located at the 18.5 milestone of Castle Peak Road. Being the largest one, it is very wide and long. You can simply walk along the beaches, passing Golden Beach, Cafeteria New Beach, Cafeteria Old Beach and Kadoorie Beach, and finally reach Castle Peak Beach. 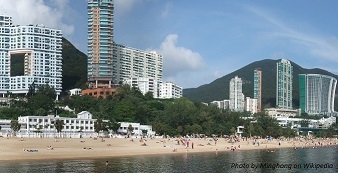 The beach was developed together with Hong Kong Gold Coast, a private housing estate and a resort area. It is a tourist attraction and one of the best places to view the sunset in Hong Kong. As the name implies, the water there is very clear. It is located next to Clear Water Bay Country Park. There are two beaches: Clear Water Bay First Beach, aka Small Clear Water, and Clear Water Bay Second Beach, aka, Big Clear Water. There is no village and virtually no building. It is a place solely for swimming and picnic. You may go BBQ and kite flying in the Country Park, or go to the nearby Po Toi O fishing village to enjoy some seafood. It is located in Sham Tseng, the 13 milestone of Castle Peak Road. There are seven beaches in the area and this one is the closest to the Sham Tseng Town with easy access to restaurants and shops. The beach is relatively short. But it has a stunning view of Ting Kau Bridge, Tsing Ma Bridge and Kap Shui Mun Bridge. The beach had been closed starting from the mid-1990s due to housing development and the construction of the bridges. As the water quality of the area has been improved in recent years, the facilities of the beach are upgraded, and the beach was re-opened in 2013. Other than go swimming and angling, don’t forget to try the famous roasted goose in Sham Tseng. Pui O means “shell bay” in Chinese. It is located in South Lantau with several villages nearby. Pui O Beach is a sand spit at the junction of fresh water and sea water. It is rich in ecological resources where the freshwater wetlands there provide habitats to buffaloes and a variety of birds. Whenever you have time, pack your bag, go camping and swimming there. Don’t miss the spectacular view of sunset. By ferry and bus: First, take the ferry from Central Ferry Pier No.6 to Mui Wo. By MTR and bus: Take the MTR to Tung Chung Station, Exit B. Then take the bus No. 3M from Tung Chung bus terminal. 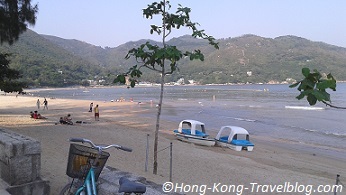 Lo So Shing Beach is located near Sok Ku Wan, Lamma Island. “Lo So” is the name of a plant in Chinese and “Shing” means city. The area used to grow a lot of Lo So and hence the name. Lo So Shing Beach is not as popular as another bigger beach on Lamma island, Hung Shing Yeh Beach. Yet, it is quieter and you can still enjoy the laid-back island life. Sok Ku Wan have famous seafood restaurants, but there is a distance in between (approximately 30-40 mins walk on this car-free island). Bringing your own food and drinks to Lo So Shing Beach is recommended. Additionally, you may see two Kamikaze Caves and visit the 150-year-old Tin Hau Temple. Silvermine Bay Beach is big and relatively quiet. It is located in Mui Wo, Lantau. There are a town and several small villages. Mui Wo had a silver mine and many villagers engaged in mining in the early days. Therefore, the beach is called Silvermine Bay Beach. At present, you can still find the remains of the Silver Mine Cave. Next to the closed cave is a beautiful waterfall and a pavilion. You can treat it as a starting point of your Lantau tour as you can find buses to every tourist attractions at Mui Wo Ferry Pier Bus Terminus like the Big Buddha. By ferry from Central Ferry Pier No.6 to Mui Wo. Tung Wan means” east bay” in Chinese. It is located on the east coast of Cheung Chau, one of Hong Kong’s famous tourist attractions. When you go swimming there, you can overlook Pok Fu Lam of Hong Kong Island. Adjacent to Tung Wan is Kwun Yam Wan, one of the driving ranges of Hong Kong first Olympic gold medalist, windsurfer Lee Lai-shan. Other than go swimming and windsurfing, you can also go cycling and hiking. Although Cheung Chau is an outlying island, it can be as busy as the city centre, especially around the annual Bun Scrambling Festival. Don’t miss those delicious seafood restaurants along the road of the ferry pier. All the beaches above are managed by Leisure and Cultural Services Department with lifeguards on duty from March/ April to October/ November. Changing rooms, shower facilities, toilets, rafts and shark nets are available. Most of them have BBQ pits and are near to hiking trails. It is usually very crowded in the weekends during swimming seasons. Car parks are usually full and traffic congestion are expected near some beaches. Therefore, it would be better to use public transport and be a considerate visitor. 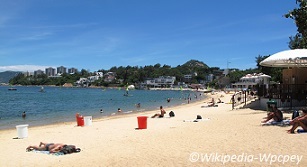 For maps and lists of beaches in Hong Kong, click here. You may also want to check the weather, water quality and safety at the beach before you go. 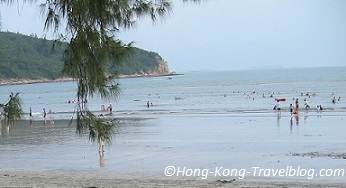 Have you been to any beaches in Hong Kong? Which one is your favorite city beach? Please feel free to write some comments and contact us if you have any questions.